The Times has a nice spread on Southern Utah today. 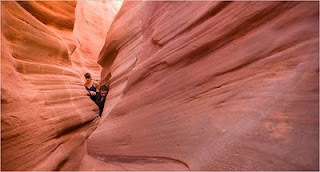 Those of you who have not yet experienced Southern Utah, love the outdoors, hiking and biking, and are thinking about vacation ideas, might I suggest Southern Utah? It will amaze you. Southern Utah is one of the things I'm going to miss dearly when I move. I will have to make another jaunt down there and do some hiking before leaving for Portland. I agree with Sra and you. Southern Utah is breathtakingly beautiful and everyone should make it a priority to visit it. It's like time stops there. That's an awesome pic. And Zion's and Bryce Canyon are terrific places!! Have you biked much out there?